Mykonos View is one of the best traditional hotels in Mykonos with international fame. 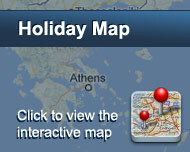 It is situated at one of the best island spots, on a hill right above Mykonos town. The panoramic view to the town and the Aegean sea make it distinguish from the rest of the same category. The small church in the highest spot makes its presence dignified, adding something from the tradition and people’s faith. The hotel architecture has elements from the traditional buildings, but stone predominates at the exterior decoration. All rooms have an independent entrance and look like a small village around the pool. The swimming pool and bar “ONEIRO” are the hotel’s nodal point that gather most of visitors. You can enjoy your swim with the best view in the island and later your drink under the starlight accompanied by soft music. The family atmosphere and the experienced personnel will make you feel at home and offer you excellent services. Είστε ιδιοκτήτης ή διευθυντής στο MYCONOS VIEW; Εγγραφείτε τώρα για δωρεάν εργαλεία, που μπορείτε να χρησιμοποιήσετε για να βελτιώσετε την καταχώρησή σας και να συνδέσετε την ιστοσελίδα σας και το σύστημα κρατήσεών σας.